iPhones are amazing things. My iPhone lets me get directions while I'm on the go. My iPhone lets me check my email no matter where I am. My iPhone takes photos and gives me constant access to twitter. There is one thing my iPhone can't do. It can't survive being run over by a car. Found that out this weekend. The hard way. 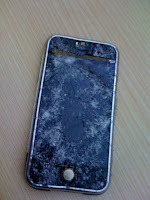 So, to the responsible iPhone owner I say, "Do not leave your iPhone on top of your car when you drive away. And if you do, do not drive up steep hills that make the phone slip off your car into the street. And if you do that, do not, and this is key, do not let other cars drive over it." But if you do, the new iPhones are pretty awesome. I would know, I now own one. It actually doesn't look to bad for being run over by a car! I played with someones new iphone yesterday, and I totally want one now. But since we are still using a macbook from last century and the original 5GB ipod in our home, I don't think we'll be upgrading any time soon! Ouch! I think I must have the best karma for devices ever because I have never lost any sort of electronic item to anything but old age or boredom with it. Now that I think about it, maybe I just live a really boring and safe life ... that's kind of lame. Dang. These are helpful things to remember about sodas, coffee, and babies, too. Good luck with the new iPhone. A funny side note, when I bought it I brought in my old phone to show to the Apple store guy. He thought it was hilarious. I bought the phone, activated it and as I was leaving, right after he said "take car of that thing" it flipped out of my hand in a dramatic display of my own clumsiness. Could have been in a movie, the moment was so classic. oops! It looks like you dog chewed it. I have don that with many objects when I had a smaller vehicle. I have total iPhone envy...Boo about running over your old one, but YEA about the new one! dude this looks better than when your dog ate the phone. but hurray for a brand spanking new iphone!